OBJECTIVE: Multisomatoform disorder (MSD) is characterised by >3 medically inexplicable, troublesome physical symptoms, together with a >2-year history of somatisation. The aim of this study was to evaluate the prevalence of depressive and anxiety disorders in a South African sample MSD, and to compare demographic and clinical outcomes in those patients with and without co-morbidity. METHODS: Fifty-one adult outpatients with MSD were recruited from primary care clinics in the Cape Town metropole. Participants were assessed for the presence of co-morbid depressive and anxiety disorders using the Mini Neuropsychiatric Interview-Plus (MINI-Plus). Outcomes included somatic symptom severity, disability, reported sick days and health care visits, pain experience, patient satisfaction with health services, and clinician-experienced difficulty. RESULTS: A current co-morbid depressive disorder was present in 29.4% (N=15) of patients, and a current co-morbid anxiety disorder in 52.9% (N=27). MSD patients with a co-morbid depressive disorder (current or lifetime) had significantly higher physical symptom counts, greater functional impairment, higher unemployment rates, more clinician-reported difficulties, and more dissatisfaction with health care services than those without the disorder. A larger number of co-morbid disorders was associated with greater overall disability. CONCLUSION: High rates of co-morbid depressive and anxiety disorders were present in a South African sample of primary care patients with MSD. Not all patients had co-morbidity, which is consistent with the view that MSD should be viewed as an independent disorder. However, co-morbid depressive disorders were associated with increased symptom severity and functional impairment, consistent with previous reports from developing countries, emphasising the importance of co-morbidity in MSD. The aim of this study was to evaluate the prevalence of depressive and anxiety disorders in a South African sample with MSD, and to compare various demographic and clinical outcomes between those with and without co-morbidity, based on the hypothesis that MSD with co-morbid depressive and anxiety disorders would be associated with greater functional impairment than MSD without co-morbidity. Fifty-one adult outpatients meeting diagnostic criteria for MSD were recruited from primary care clinics in the Cape Town area. Participants were recruited for a selective serotonin reuptake inhibitor (SSRI) treatment study,11 and data on co-morbid disorders were collected in this group. Exclusion criteria included current or past bipolar mood disorder, psychotic disorder or substance abuse/dependence, serious unstable medical illness, pregnancy or breastfeeding, significant risk of suicide, concurrent cognitive behavioural therapy, or use of psychotropic medication. The study was designed and conducted in accordance with the Declaration of Helsinki, and the Stellenbosch University institutional review board approved the protocol. All participants provided written, informed, voluntary consent. Participants were assessed for the presence of co-morbid depressive and anxiety disorders using a structured diagnostic interview based on DSM-IV criteria and the Mini Neuropsychiatric Interview-Plus (MINI-Plus), Version 5.12 Those with somatic symptoms only in the context of a psychiatric disorder other than MSD (e.g. dizziness occurring only during a panic attack) were excluded. Demographic data were collected, together with reported sick days and health care visits in the 3 months preceding the assessment. The Patient Health Questionnaire (PHQ-15) was used to measure severity of functional somatic symptoms.2 The PHQ-15 comprises 15 commonly encountered somatic symptoms, each scored from 0 ('not bothered at all') to 2 ('bothered a lot'). Contingency tables with the maximum likelihood chi-square test as test statistic were used to compare nominal response variables with other nominal variables. Analysis of variance (ANOVA) was used to compare continuous response variables with nominal variables. Levene's test was used to check for homogeneity of variances, and the Shapiro-Wilk test to test the residuals for normality. The Mann-Whitney U-test or the Kruskal-Wallis test was used if the residuals from the ANOVA were not normally distributed or if the response variable was ordinal. A significance level of 5% was used in all statistical tests. 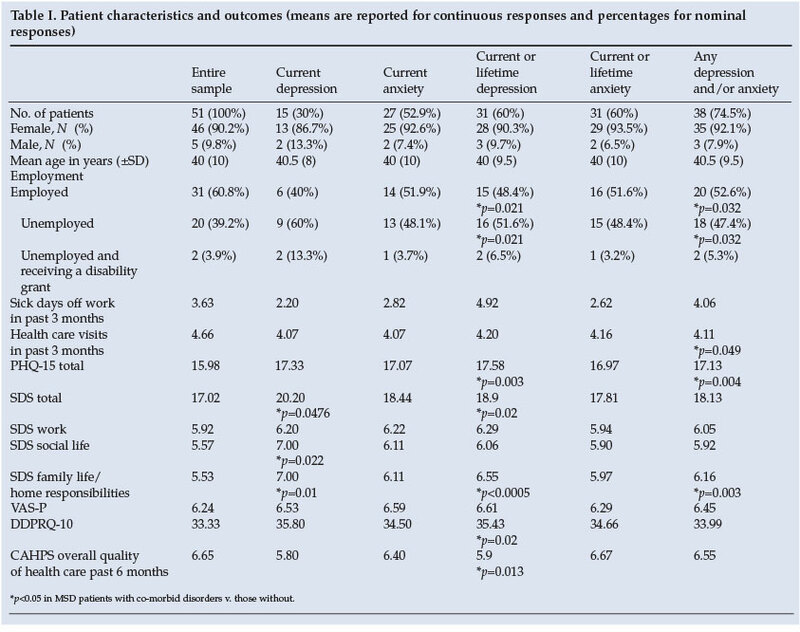 Demographic data and other outcomes in the entire sample, and those with a current depressive disorder, a current anxiety disorder, any depressive disorder (current or lifetime), any anxiety disorder (current or lifetime), and any co-morbid depressive/anxiety disorder (current or lifetime) are shown in Table I. The sample consisted of 5 males (9.8%) and 46 females (90.2%); mean age 39.6 years (standard deviation (SD) 9.9). The majority were Caucasian, married, employed, and had a secondary school education. Dysthymic disorder (N=14 - 27.5%) was the most common current depressive disorder, followed by current major depressive disorder (MDD) (N=1 - 2%). Generalised anxiety disorder (N=24 - 47.1%) was the most common current anxiety disorder, followed by social anxiety disorder (N=10 - 19.6%), agoraphobia (N=3 - 5.9%) and panic disorder (N=2 - 3.9%). MDD (49%) was the most common lifetime depressive disorder, and 13 (25.5%) patients met diagnostic criteria for a lifetime panic disorder. Any current co-morbid depressive disorder was present in 29.4% (N=15) of patients, and a current co-morbid anxiety disorder in 52.9% (N=27). Any anxiety disorder (current or lifetime) was reported in 60.8% (N=31), and any depressive disorder (current or lifetime) in 60.8% (N=31) of MSD patients. A current or lifetime co-morbid depressive or anxiety disorder was present in 74.5% (N=38) of participants. It was notable that most patients with lifetime co-morbid disorder also had a current co-morbid disorder, suggesting chronicity of the co-morbidity. Physical symptom count and disability measures were compared in those with/without a co-morbid depressive or anxiety disorder. Significantly higher physical symptom counts were reported by MSD participants with a current or lifetime depressive disorder (p=0.003), and by those with any current or lifetime co-morbid depressive or anxiety disorder (p=0.004). MSD patients with a current co-morbid depressive disorder had a significantly higher degree of overall (p=0.0476), social life (p=0.022) and family life/home responsibility (p=0.01) impairment than those without such co-morbidity. Those with a current or lifetime depressive disorder reported significantly more overall impaired functioning (p=0.02) and impaired family life/home responsibilities (p<0.0005) than those without such a disorder. Those with any co-morbid depressive or anxiety disorder (current or lifetime) had significantly more family life/home responsibility impairment (p=0.003) than those without. Mean PHQ-15 scores and disability measures of patients with any 1, 2, 3 and 4 or more co-morbid disorders were compared. A greater number of co-morbid disorders tended to be related to greater symptom severity, and 4 or more co-morbid disorders were associated with significantly higher levels of overall disability (p=0.041) and impaired family life/ home responsibilities (p=0.0046). Age, gender, race, marital status, level of education, and VAS-P pain rating scores did not differ significantly between patients with or without a co-morbid disorder. However, employment status differed significantly across the groups. Compared to the entire sample (60.8% employed v. 39.2% unemployed), patients with a current or lifetime depressive disorder (48.4% employed v. 51.6% unemployed; p=0.021) and those with any current or lifetime co-morbid anxiety/ depression (52.6% employed v. 47.4% unemployed; p=0.032) had higher unemployment rates. MSD patients with any co-morbid depressive or anxiety disorder (current or lifetime) had significantly more health care visits in the 3 months preceding evaluation (p=0.049). Participants with a co-morbid depressive disorder (current or lifetime) were rated as more difficult and frustrating by clinicians (p=0.02); and these patients rated their overall health care in the past 6 months as poorer (p=0.031) than those who had MSD only. The main findings of this study were: (i) a high prevalence of co-morbid depressive and anxiety disorders in South African subjects with MSD, consistent with previous reports in developed countries;3,9(ii) significant associations of co-morbidity in MSD with somatic symptom count; and (iii) significant associations of co-morbidity in MSD with disability, clinician-experienced difficulties and lack of patient satisfaction. Previous literature indicates that total somatic symptom count (irrespective of cause) is strongly predictive of the presence of a psychiatric disorder.3,5,8 In our MSD sample, a high somatic symptom count was associated with the likelihood of a co-morbid depressive or anxiety disorder. MSD patients with any co-morbid depressive or anxiety disorder were significantly more disabled, and were more likely to be unemployed and make greater use of health care services than those with MSD only. Moreover, having >4 co-morbid disorders was significantly associated with greater functional impairment and poorer family life/home responsibilities. The presence of a co-morbid depressive disorder was associated with increased clinician frustration and patient dissatisfaction with the overall quality of health care services. These findings are consistent with previous literature: somatisation has a detrimental effect on various health outcomes,5,7 and the presence of a co-morbid depressive disorder may have a cumulative effect on impairment, medical utilisation, clinician-experienced difficulties and patient dissatisfaction. High rates of co-morbidity may lead to suggestions that somatoform disorders be better conceptualised as a severity marker of depression or anxiety, rather than an independent disorder. However, some evidence is consistent with the concept of MSD as an independent disorder. In our sample, a quarter of the patients had no co-morbid depressive or anxiety disorder. Previous literature indicates that medically unexplained symptoms often arise without concurrent depression or anxiety, with at least a third of such patients having somatisation alone.3,5,7,8 Moreover, MDD has an episode co-morbidity of 63 - 66%.16,17 These rates are not so different from co-morbidity rates reported in studies on somatoform disorders as to argue that MDD is an independent entity, whereas somatoform disorders are not. In conclusion, MSD with co-morbid depressive and anxiety disorders is common in primary care. Such co-morbidities are associated with an increased number of somatic symptoms, greater disability, increased provider frustration, and patients' unmet health care expectations. However, delineating the relationship between somatisation and depressive and anxiety disorders still holds many challenges. Future research may address the pathophysiology and clinical course of MSD in those with/without co-morbidity, and investigate the influence of certain genetic and environmental factors (e.g. childhood adversities) on its pathogenesis. At the time that this study was conducted, Professor Stein and Dr Muller were funded by the Medical Research Council of South Africa. This study was funded by H Lundbeck A/S.